M&T Bank is offering customers the new option of custom check card designs. Through the new service launched this month, customers at the Buffalo-based company can show off their unique style with every purchase by choosing their own images for the front of their check card. Whether it's a photo of a family pet, a favorite vacation spot or a child's art project, customers are in control of their own card design, said Darren King, executive vice president for retail banking at M&T Bank. "Giving M&T customers more choices, from designing their own check card to banking on the go with our new mobile applications, allows consumers to create the type of banking experience that fits their own lifestyle," King said in a release. Bank customers can either use their own image or choose from a gallery of more than 270 images provided by M&T Bank, including special designs featuring the Buffalo Bills, Baltimore Ravens, and Dover International Speedway's popular icon, Miles the Monster. M&T Bank is the official bank of the Buffalo Bills, Baltimore Ravens, and Dover International Speedway and is the exclusive provider of Bills, Ravens and Monster Mile check cards. Another available option allows customers to put their own thumbnail photo in the upper corner of their check card, for a personal touch. Customers will be charged a one-time fee of $7.95 for the custom card. This fee is only charged at the initial setup of the image and will not be assessed if the card subsequently needs to be replaced. 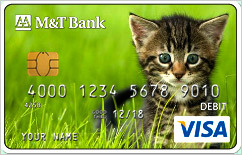 M&T Bank reserves the right to approve or reject any image submitted for a custom card design. Customers can sign up for the customized card when opening a new checking account in an M&T Bank branch. Existing customers with an M&T Check Card or M&T Check Card for Business can also access the new service through Web banking or at www.mtb.com/customcard. Upgrading an existing card will not require any change to the account number or expiration date. Cardholders simply enlarge, rotate, move or flip their image to get the card design they want in a matter of seconds. The card is then produced and mailed to the customer through M&T's standard card mailing process. M&T Bank, founded in 1856, is one of the top 20 independent commercial bank holding companies in the nation, with $80 billion in assets and 750 branch offices in New York, Pennsylvania, Maryland, Delaware, Virginia, West Virginia, and the District of Columbia.